Fabric Paper Thread: Can we ever see too many flowers? Can we ever see too many flowers? A few more photos from my latest visit to Butchart Gardens. I admire the gutsy colour combination of white, pink, and orange tulips underplanted with blue forget-me-nots. Another larger view, taken from above the sunken garden. I love the masses of color and all the curved lines. When we lived in Ecuador, I had a local handyman help me dig out some new beds. I had laid out a garden hose to indicate the shape of the bed. He thought it absolutely crazy - all graceful curves. Straight lines is what he preferred. After the beds were dug, though, he admired the effect. A green door on an outbuilding. Love the vine creeping up the walls. The Japanese Garden is a peaceful place without a lot of showy colour. The red bridge really pops in the green landscape. More curving lines that lead the eye and the foot. This garden is designed and maintained by professionals, but there are many wonderful principals to apply to home gardens as well. Every time I go I think of something else that will improve our own little piece of this earth. Linking to Mosaic Monday, hosted by Mary of the Little Red House. Such a beautiful place they have designed for us all to enjoy. Oh goodness! I would feel like I was in heaven there! Beautiful. The gardens offer inspiration in every season. I love the bold, bright tulips - their beauty passes so quickly - you were fortunate to visit at just the right time. The photos are lovely. In the second photo I love the little family with their hats and pink dresses - all ready for a garden party. We visited at the end of Summer and the gardens were full of dahlias. Absolutely spectacular! The best gardens I have been to ... EVER ! It has been decades since I visited Butchart Gardens - beautiful photos! Just stunning, Lorrie. The view of the curvy gardens is so pretty and I love the riot of colour in the tulips. I hope you're having a sunny weekend there. I think one can learn so much from professionally laid out gardens, translating them into 'home-sized' spaces. This week we have the Chelsea Garden show and I'm looking forward to seeing the amazing garden ideas. Enjoying seeing the red bridge again from a different angle...one of your photos is a favorite yet and it was taken of that little red bridge. Glorious tulips in some amazing colors. I always prefer a curving edge. What a fabulous place! in my view we can NEVER see too many flowers. Looks like a wonderful place to visit. Simply beautiful. Very pretty mosaic too. Love the curving lines in the gardens- it really makes things more interesting. Lorrie, you are so lucky to be close enough to Butchart Gardens to go throughout the seasons and savour the colourful flowers. The only time I was there, the gardens took my breath away and so I always love it when you share more of this wonderful place. Nope, in my opinion there is no such thing as too many flowers. 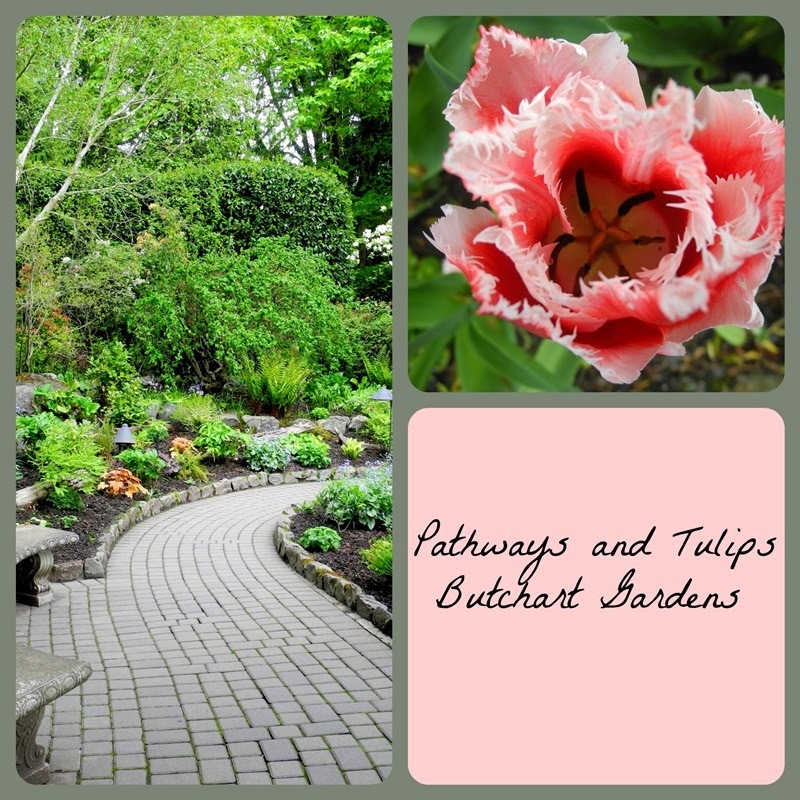 Your latest photos from the Butchart Gardens... Breathtaking!! Butchart Gardens must be quite the inspiration, but I believe that you have an "eye" of your own! No, there is no such thing as too many flowers!!! What a beautiful garden. I am glad you shared more photos of its beautiful designs and flowers. I love the green color on that door. And I am with you, I like the vine creeping up the wall too. Your post brings back lovely memories of our visit to Butchart over two decades ago! The tulip in your collage is stunning, the vine growing near the green door looks very like the Virginia Creeper that covers the front of our home. Yes too many flowers..I'd prefer snow. ( NOT!!! :) Just lovely! No you can never have enough flower shots especially when there are as wonderful as these. I do love the graceful curving lines of the beds and the sidewalks here. Also the pretty array of tulips and that bright red bridge. Thanks, enjoyed seeing more of the beautiful gardens. Beautiful !!!!!!! No - never to many pics of beautiful flowers! LOL Thanks for sharing them with us. I just love this garden, but have never seen it in full bloom such as in the pictures. No to your question Lorrie, we can never see too many flowers ;). I am so happy to be seeing so many colours of Spring that will lend us a hand into Summer soon. Those images of the garden are wonderfully beautiful! It's been a long time since we've been to Butchard Gardens . .. so it's nice to see your photos . . . probably in it's prime right now. Wait, the roses are coming. I would love to take my mom. Maybe a plan will have to be set in place. That first photo is breathtaking Lorrie - I love the different coloured tulips popping up from the carpet of bright blue forget-me-nots! It's a real joy to 'visit' the wonderful Butchart Gardens through your lens Lorrie - thank you! No, it's not possible to see too many flowers! These are so beautiful. You have a way of creating a little heaven on earth with your camera. I love going to Butchart Gardens... any time of year. Thanks for the gorgeous glimpses. Be still my heart! I love all of these and wish I could see that beautiful garden again!